Pacemakers are devices that regulate the rhythm at which the chambers of the heart pump blood, intended for people who have developed irregular heartbeats. This may happen for reasons related to genetic, environmental or lifestyle factors, or a combination of all these. Some pacemakers are designed to co-ordinate the pumping action of the left and right sides of the heart, which if left uncorrected can lead to abnormal cardiac rhythms or other conditions. They work by delivering a tiny electrical impulse into the existing nervous circuitry of the heart. Some types of pacemakers produce a constant cardiac rhythm, while some others can vary this rate in response to the needs of the patient, for example delivering an increased rate in response to exercise. Pacemakers are associated with prolonged lifespans and life expectancies in those fitted with them. However, electronic pacemakers are also linked to some problems; including their size. Even though modern units can be only the size of a grain of rice, some users still find them uncomfortable to wear. 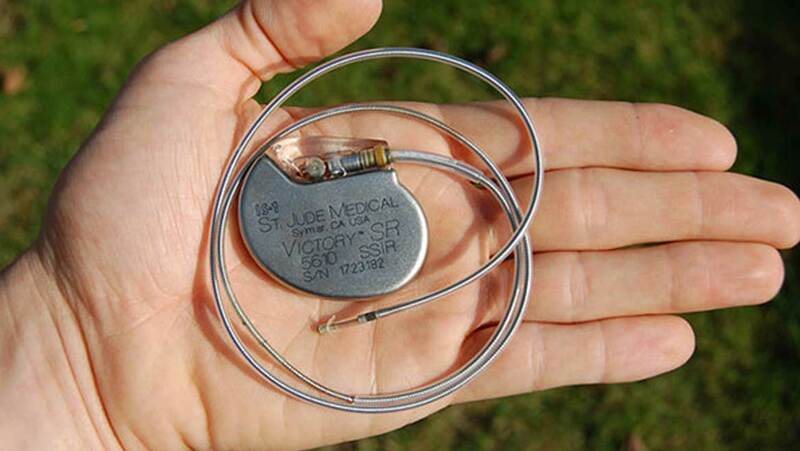 Pacemakers are implanted in the chest, as are the wires connecting them to their power supplies. This arrangement raises the possibility of pacemaker complications, which include infection or irritation around these wires, sometimes termed ‘leads’, and abrupt battery failures. There are also some reports of corrosion in pacemaker leads, and even product recalls that have resulted in impromptu removal surgeries for those patients affected by either of these potentially dangerous events. Even if the pacemaker functions well without adverse reactions, the battery may still wear out over time and need to be replaced, which often entails further surgery. These procedures are relatively minor, but also carry risks of infection, failure and other complications. Medical professionals and scientists who use or study devices that are implanted in living patients believe that these devices would be much improved if they could be charged in a battery-independent manner, or at least in a way that eliminates the need for leads. There are alternatives to traditional pacemakers with leads, not least of which is the Medtronic Micra™, a tiny, coin-sized pacemaker with its own built-in battery. This device can be implanted directly into the heart, as opposed to historical pacemakers which are restricted to the more superficial areas of the chest cavity due to the presence of the leads. However, this new style of pacemaker still needs to be replaced every six months, in line with the maximum capacity of a Micra™ battery. A theoretical improvement on this device would be a pacemaker that can recharge wirelessly using forms of electricity that could pass through skin and tissues. A collaborative team from Rice University and the Texas Heart Institute have taken what could be a significant step forward in the development of these truly wireless pacemakers. The team, led by Professor Aydin Babakhani and Dr. Mehdi Razavi, presented their new pacemaker prototype at the 2017 IEEE International Microwave Symposium, which took place in June. It consists of a miniature board with a switch, a power-managing chip (which are P- and C-type metal-oxide superconductors (MOSs) respectively) and a capacitor. The capacitor stores energy, which is radiated towards the device in the form of radiofrequency waves in the 8-10GHz range. The entire board measures 16mm by 3.8mm, and was successfully implanted into an animal to demonstrate its efficacy in the experiment as presented. The team claims that the new MOS-based pacemaker can compare well to a traditional rate-managing device. It was found to regulate the heartbeat consistently, avoid abnormalities such as arrhythmias, and work unobtrusively so that the patient is not disturbed by necessary changes in rate-control. The team also asserts that it can adjust the heart rate at need, and could modulate it from 100 to 172 beats per minute. Much like the Micra™ pacemaker, it can also store ‘presets’ it receives from an external source, ‘learn’ the thresholds to use when generating pace-making impulses, and operate constantly based on these parameters. So, the new leadless pacemaker can charge wirelessly and may eliminate some major complications associated with cardiac rate-controlling. However, they do have some limitations. It is a very preliminary device, obviously, and has a long clinical trial process ahead of it before it can compete with devices like Medtronic’s Micra™ pacemaker. In addition, as with the Micra™, this pacemaker type may be able to control circulatory functions in only one chamber of the heart (out of four; two of which are to the right and the others to the left), whereas more conventional models with leads can control two chambers at once, which can be to either side of the organ. Therefore, leadless pacemakers with wireless charging will need to get more complex or more powerful in the course of their development. Alternatively, some patients may need to have two of these devices implanted at the same time. On this note, the newer forms of pacemaker also have the advantage of not requiring open surgery for their placement. Instead, they are introduced into a large major blood vessel with a relatively direct route back to the heart, such as the femoral artery, through the skin, from which point they are guided along their way into their ideal locations in the heart. This holds true for both the Micra device and the new MOS-based regulator. Whilst pacemakers are life-saving in some cases, these electronic medical implants also have a history of being cumbersome and prone to lead-associated complications. This has led to a generalised call for lead-less pacemakers with simplified, less invasive placement, which has only recently been answered, as we mention above. Unfortunately, these devices still depend on inbuilt batteries with a reduced endurance. This recent project which resulted in the demonstration of a working, truly wireless pacemaker that charges using radio-frequency micro-waves (which can pass harmlessly through living tissues) may prove a likely new direction in pacemaker technology. Devices such as these may help people to power their medical implants consistently on the go. Wellens HJ. Forty Years of Invasive Clinical Electrophysiology. 1967–2007. 2008;1(1):49-53.